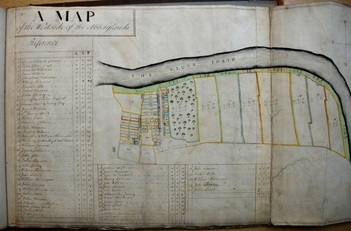 These images are taken from a volume containing 16 plans of Cowane’s and Spittal’s lands surveyed by Mr MacDougall in 1759. These images show the feus which made up Cambuskenneth, with the ‘crofts and tofts’ appearing as narrow strips of parallel land. 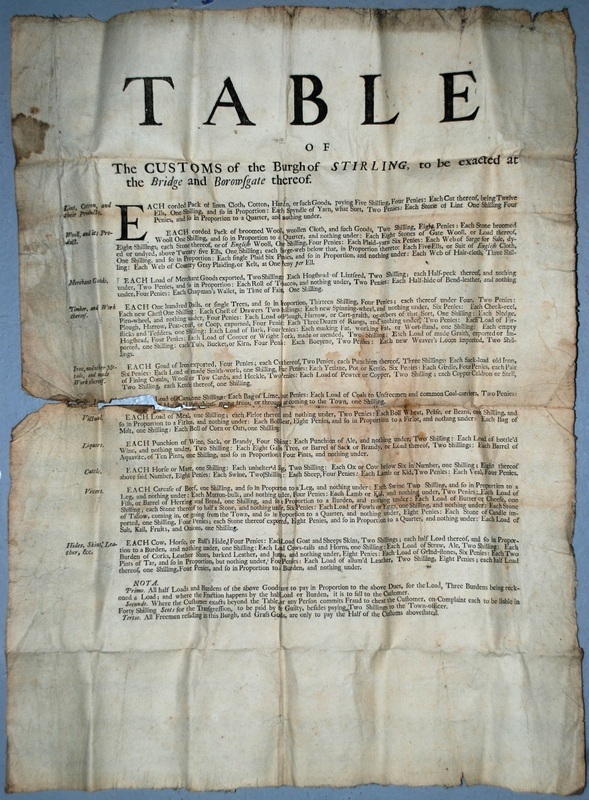 Each parcel of land is numbered and the reference key on the left lists the name of the owner and the size of the feu, measured in Scots Acres, Roods and Feet*. The basic layout of the main street (North Street?) appears remarkably similar to Cambuskenneth today. On the right of the street is the Ferry Orchard, at the time of the survey feud to John Dixon, comprising 7 acres 1 Rood and 23 square feet. 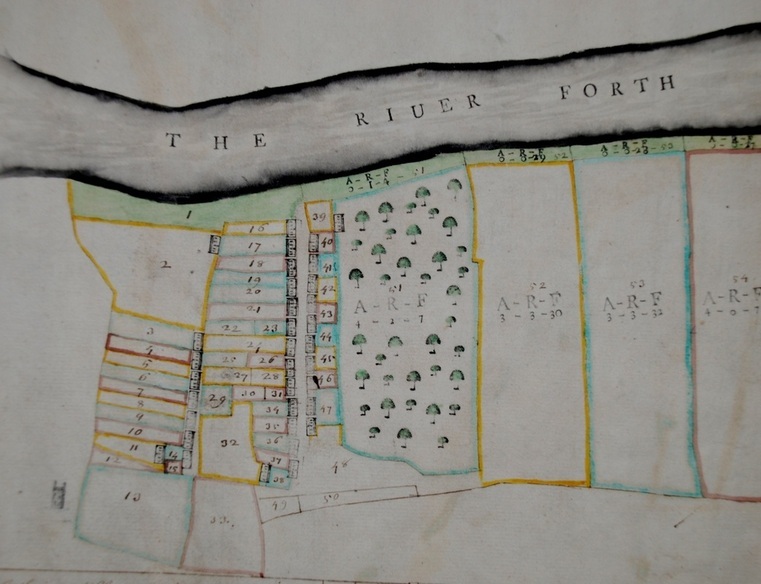 (There were eventually four orchards at Cambuskenneth: in addition to the Ferry Orchard there were also the Tower, St James and Ladysneuk Orchards). To the bottom left, one can see the remnant of Cambuskenneth Abbey, built in 1147 for the Augustinian Canons by David I. At the top of the map (which faces west) was the ferryboat crossing point to Riverside which connected Cambuskenneth to Stirling, though this is not marked on the map in any way, nor is the Ferryman’s Cottage which remains to this day. A pedestrian bridge was finally installed in 1935 which signalled both the demise of the ferryboat and the need for a Cambuskenneth primary school as pupils could now cross over to the Riverside Primary School with ease.